Unless you were one of the 160,000 thousand people in the near vicinity of the Fukushima disaster who evacuated their homes in 2011, the ongoing nuclear crisis on Japan's shore can seem awfully far away. It's worth remembering, though, that the radioactive waste leaking from the plant has been making its way into the Pacific Ocean, and from there, to the rest of the world. According to new research from the Centre of Excellence for Climate System Science, the radioactive ocean plume from the original disaster will reach the west coast of the U.S. by 2014, 3 years after it was first released. That image, created by the NOAA in the aftermath of the 2011 tsunami that damaged the Fukushima plant, was meant to project the wave heights it generated. "It does NOT," the NOAA adds, "represent levels of radiation from the damaged Fukushima nuclear power plant." The image at the top of this post, taken from the web simulation, show what's likely to really happen. 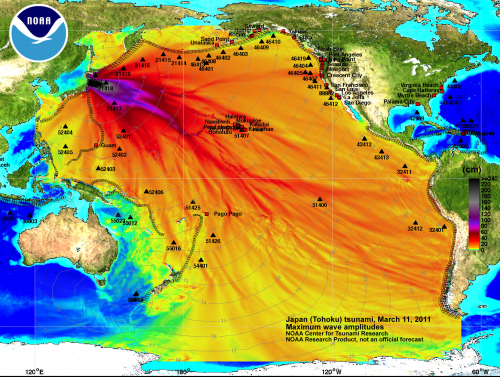 According to the report, "two energetic currents off the Japanese coast—the Kuroshio Current and the Kurushio Extension—are primarily responsible for accelerating the dilution of the radioactive material, taking it well below WHO safety levels within four months [of the incident].” The radioactive particles will then travel eastward as they're further diluted by eddies and whirlpools. They'll hit Oregon first, and then California by 2016. So far, it seems that fish aren't widely affected by the radiation. That's good news, because its 30-year half-life means it's not just going to disappear anytime soon.